That determined work ethic is what spurred Ginocchi’s West Branch High School competitive cheer team on to kudos like third place at the 2015 AmeriCheer Internationals, seventh place at Ohio’s state competition, and series grand champion at their local CheerTime competition. How did your coaching career start? Ginocchi: I was hired as a teacher at West Branch Middle School 28 years ago, and was told the high school cheerleading coach had just resigned. Having been a competitive cheerleader since I was young and recently cheered for Youngstown State University, I knew I wanted to coach once I started teaching and have been doing it ever since. Cheerleading was in my blood—and I didn’t want to give it up! As our 2015 Coach of the Year, you received nominations from your athletes; tell us more about your coaching style and why you think it works. Ginocchi: I have to look at the individual athlete and the team’s chemistry and change my structure every year depending on those factors. We have a conditioning program and belong to a local gym with a gymnastics coach; she’s tougher than me and plays “bad cop” a lot. Conditioning is very important, and that’s the first thing I stress to the kids: “If you want to compete you’ve got to be in shape.” It’s something the athletes don’t like, but when they have success, they buy into it. This year we had great results and fewer injuries. Do you do any work with all-star gyms? Ginocchi: We’re at Competitive Edge Fitness & Dance in Alliance, Ohio, about two days a week as a team. We also practice two days in the school gym on the mat. My athletes are required to take some individual lessons from the gym coach at Competitive Edge. The gym owner is a graduate of West Branch High School and lets us use the gym free of charge when we’re there as a team. Then, the athletes are there for individual lessons two to five days a week, for which she charges a minimal fee. It’s a very unique situation that I have—not all coaches have that and I take full advantage of it. I’ve been working with this gym owner for about two years. I think it’s great because the athletes are getting critiqued from someone who’s an expert in tumbling and jumps, [while] getting dance and choreography feedback from me. Are any of your high school cheerleaders also on all-star teams? Ginocchi: No, but I’ve had many of them pursue at the collegiate level, some at Division 1 schools. I have no problem with my athletes being on an all-star team as long as they’re true to our team and can balance both. 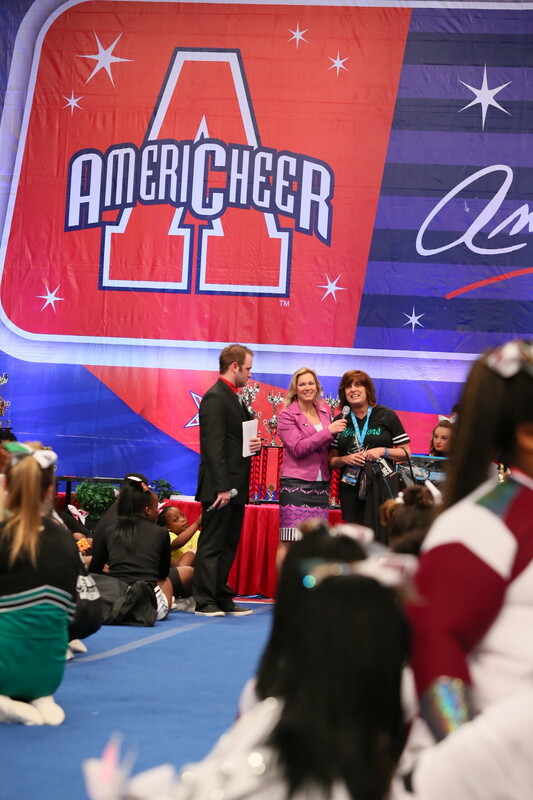 What aspect of your coaching cheer are you most proud of? Ginocchi: I’ve had up years and down years, and being true to myself and my philosophy of coaching is what helps me. I thrive on adversity! When you’re winning, the coach is the greatest thing in the world, and when you lose, not so much. You have to stay focused and know what the right thing to do is—regardless of what people are saying. After 28 years, I very easily could have thrown the hat in, but…if you are true to yourself, you can weather the storms. Then, when you reap those benefits, there’s nothing better!